I found this to be quite funny, a Christian on Facebook seemed to be a bit too enthusiastic about the rapture and decided it was just about to happen, as if it were moments away. Sadly, it’s been posted since lunch time and it’s around night time now, I don’t have the heart to tell this guy that the rapture isn’t going to happen tonight. Would anyone like to do it? I almost feel sort of embarrassed for the guy! Then I remembered he was a Christian and the only way he gets through life is to believe the rapture is imminently upon us. Unfortunately, most Christians who are over excessive in their excitement of the rapture fit into the mould of those who forget that no one knows when it is going to happen, not even Jesus knew. It must be depressing to wake up everyday and believe that the rapture is going to happen and going to bed knowing it hasn’t. 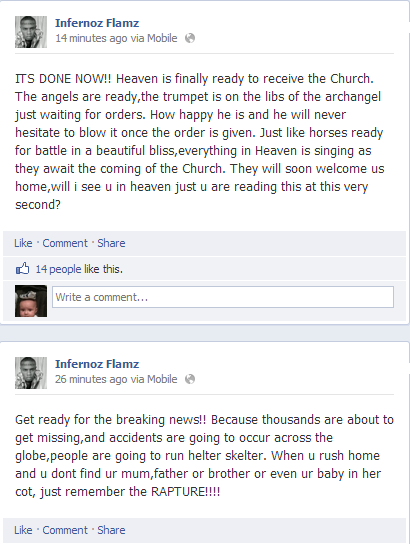 I think he should focus more on preparing for Judgment Day rather than complaining about the Rapture. Yeah, not even “God” knew!